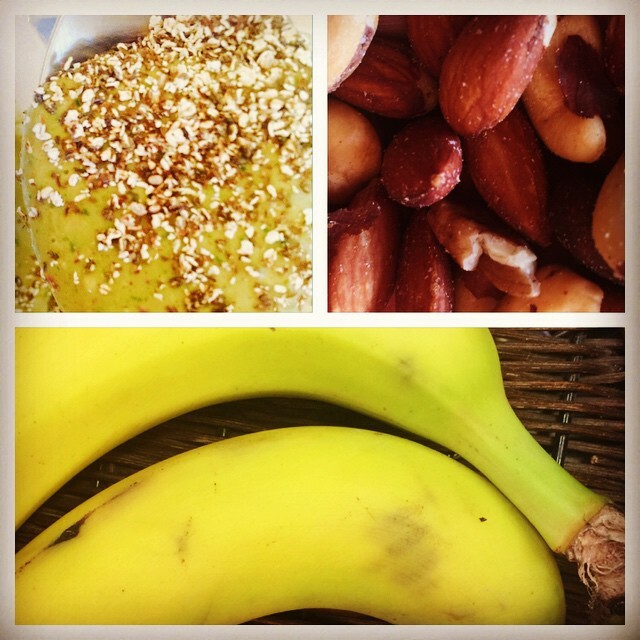 Banana Pudding Smoothie with Chia and Nuts…DELISH! This is so good and tastes just like banana pudding! No dairy, wheat/gluten-free, soy or added sugar. 1 big tablespoon of almond butter (2 tablespoons = to 1 serving = 170 calories; so pay attention here. Also, make sure you get an almond butter than is made with almonds only! Sea salt is fine, but NO sugar or added oils. Not necessary and junks up your almond butter which is fabulous just as almonds!) You know what to do: read the label or grind your own. Toss in your blender or Vitamix. Give it a good spin. Pour into your favorite glass, mug or bowl (I love it thick!). Top with Gaia Ground Chia and a few nuts.